make your inner spirit feel good | stesha rose. Do you recognize this skirt? You may have seen it worn this season on the Bachelorette, on one of Des's date nights with Chris. I was super excited when I saw she was sporting it, then I remembered she is just a normal girl like all the rest of us (except she gets 25 men chasing her!) Anywayyyyys, I guess I am sticking with the casual theme these past few weeks, taking pieces you may think should be dressed up but actually look great dressed down. I am in Vernon (you will want to click the hyperlink, this town has 50k people!) all summer which is great for scenic photos & summer time weather however there is not much to get dressed up for here. And when I mean not much I am actually referring to nothing! I refuse to to wear "comfy clothes" as many people say because I truly do believe if you get up & look good, you will feel good. So casual or fancy make sure you put a fabulous outfit on each day, your inner spirit will thank you! This is so cute! I love that skirt and how you dressed it down with the denim vest! What a gorgeous skirt! Loving how you styled it too. Sequins and denim are always a great combination in my book! Did you watch The Men Tell All on Monday night? I have this horrible feeling that Des is going home alone. Then again, they always use those commercials to their advantage and it's never what you think. Ah, driving me NUTS! Such a great skirt! 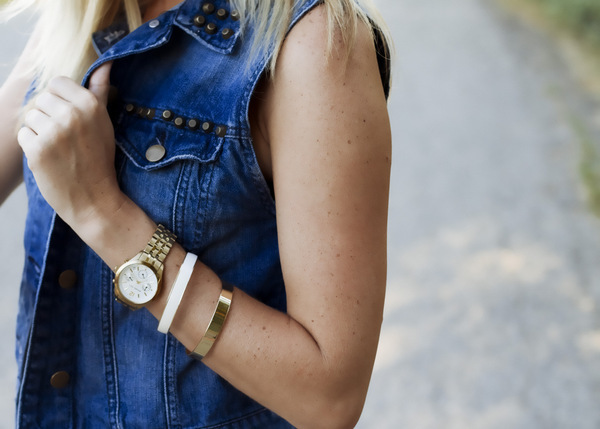 And I am loving denim vests right now too! Perfect summer go-to. love that skirt. & too fun that it was on the Bachelorette! Great skirt, I love it. You can wear it in the winter with dark hoses? Love your skirt - such a cool print! You look amazing in a casual or dressy outfit! Bring that skirt with you when you come visit! I want to play dress up in it!!! :) I cannot believe you will be here next week! I better start cleaning my house!! LOL!! You are wearing two things that I need in my closet...a denim jacket and a cute printed mini skirt! Love it!